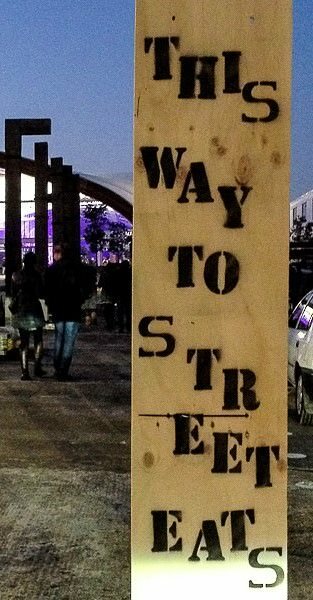 At the end of August the Auckland Restaurant Month finished with a day of Jazzy Street Eats in Shed 10, Queen’s Wharf. With a diverse line up of central city restaurants serving up their favourite street food for this one day only. There were tastes from around the globe, from Middle Eastern shawarma to Asian summer rolls, Tuscan donuts and much more. We arrived late in the day when some of the food was running out after the end of a very successful event. But we enjoyed sharing in the fun of the AKL Street Eats with everyone relishing the good food and wine as well as great music. This entry was posted in Food, Jazz, New Zealand, Wine Blog and tagged AKL, Auckland, Liam Neeson Tribute Band, Queens Wharf, Shed 10, Street Eats by Brett, the Wine Maestro. Bookmark the permalink.